First Offshore Wind Project of India (FOWPI) is a project funded by European Union (EU) and it aims to support Ministry of New and Renewable Energy (MNRE) and National Institute of Wind Energy (NIWE) in strengthening the country's offshore wind energy sector and provide technical assistance in preliminary implementation of first off-shore wind farm project of India, on a sea bed area of 70 sq. km. with a tentative capacity sizing of 200 MW near the Gulf of Khambat, approximately 25 km off the coast of Gujarat. FOWPI's scope includes technical advisory designs which shall be used by the Indian offshore wind stakeholders to advance preparations and reduce risk for project developers and investors. FOWPI will bring the vast experience from offshore wind rich countries of Europe to the Indian wind industry and help the country in strengthening its offshore wind energy sector. This web portal is developed with an objective to act as a useful source of information about offshore wind energy industry globally. FOWPI project is led by COWI A/S Denmark with local key-support provided by WinDForce Management Services Ltd and COWI India Ltd involved in the project implementation. The project is well supported by European Union (EU), Ministry of New and Renewable Energy- India (MNRE) and National Institute of Wind Energy- India (NIWE). Project is awarded under the Clean Energy co-operation in India and funded through the partnership instrument of the European Union. FOWPI will undertake specific technical studies for the selected area of 70 sq. km. under Zone-B (as outcome of FOWIND project), including coastal surveys, environment scoping, cost-benefit analysis, electrical transmission layouts, wind farm key components and its conceptual design, and other relevant technical studies as identified. FOWPI team has gathered the information about existing wind farms like London Array, Gwynt y Môr, Greater Gabbard, etc. Mr. Per Volund has extensive experience of 25 years in the offshore wind energy sector particularly in wind project development, contracting and construction activities. He played a role of technology innovator and pioneer in the development and implementation of the Danish’s 40MW offshore pilot project of Middelgrunden OWF (Offshore Wind Farm). He holds 15 years of track record in management of O&M activities for offshore wind farms in Europe. For about a decade, He managed the implementation of low cost concrete gravity foundations and cabling concepts. He was also involved in the UK Round on 3 supporting projects. Mr. 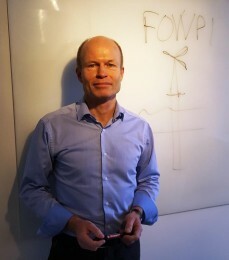 Per is the Project Head for FOWPI and believe to bring the vast offshore experience to India.